Bells ring out in the City of Churches for a Saturday afternoon wedding. St Peter’s Cathedral, on the banks of the flowing Karrawirra Parri or Torrens River, overflows with revellers. And next door sits the comparatively quiet Adelaide Oval, where the unbeaten Tigers are warming up, one day ahead of playing the unbeaten Crows for top spot on the AFL ladder. The roof inside the stadium is rather beautiful, shaped like sea shells and sheltering thousands of seats in grandstands named for Bradman and Chappell, Ricciuto and Wanganeen. At one end behind the goals is the grassy hill—a gorgeous gap in the edifice of the venue. It is something of a throwback feature in modern arena architecture, as is the historic manual scoreboard. This is a marvellous venue for sport, many suggest the best in Australia, and, as is the way with all modern stadia, it has a pristine surface. Adelaide Oval has its imperfections and quirks though, too. The pockets, for instance, are shallow. Walk even 15 metres along the boundary line from the point post, as Justin Leppitsch does now during the captain’s run training session, and you are left staring at a wide goalmouth target. The mercurial Eddie Betts has made this pocket famous for the seemingly impossible goals he often kicks here but—with no disrespect to his legend—the angle is incredibly favourable. So obtuse, so forgiving. Far more so than on any other AFL ground in the country. He tells a few of the players this because in 24 hours they will enter this serene space and find instead a crucible—a true battle in enemy territory, against a top team, with an infamously rabid home crowd at their backs. The coaches know it will be a factor. Only a day earlier, in Melbourne, Ben Rutten, a former Crow, began his opposition analysis at the Punt Road Oval not by dissecting Adelaide’s offensive brilliance, or the contested ball power of midfielder Matt Crouch, or the run-and-gun handball weaves of their rebounding defenders, but by considering the oval itself. He talked to the players in this meeting, too, about taking an attacking mindset to the game. 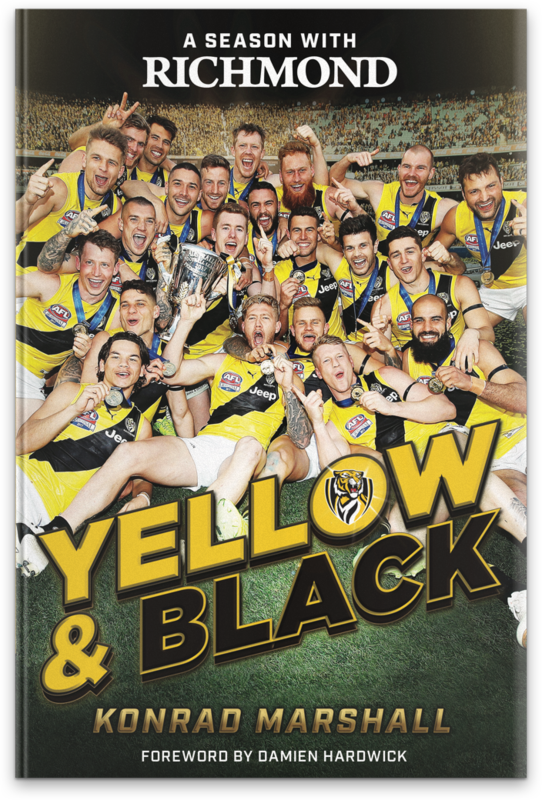 The Crows have, up to this moment, beaten their 2017 opponents by an average margin of 45 points, and so there is an inherent risk that the Tigers will fall into the trap of playing only to limit that scoring power. He shows footage of the Crows losing a final last year against the Swans—three video clips that demonstrate how Richmond can win. In the first, a Crows defender tries to clear the ball with a short kick but it is intercepted. “Covering their exits,” says Rutten. The second clip shows Sydney outnumbering Adelaide in a contest, and a Swan player streeting away with the ball. “Two versus one,” he says. The third clip is of young Sydney onballer Isaac Heeney crashing into a Crow and emerging with the football. “Wanted it more,” says Rutten. On level one of the hotel where the Richmond team is staying, there is a small room populated with a few chairs and massage beds, the temporary treatment room for the players to receive rub downs and therapeutic massages. Now however, around 5:30pm, it is the venue for the Tigers defensive line meeting. The players—Conca, Rance, Ellis, Short, Astbury, Grimes and Houli—are dressed casually, having just come from their pool recovery after the final training session. They chat now in the little conference room, debating the size of the flatscreen TV (100 inches?) while sparking a little laugh or two by drawing dicks on the whiteboard. Rutten, wearing thongs, dims the lights to present a summary of strengths and weaknesses, but the point of the meeting runs deeper. It is ostensibly to voice any final encouraging thoughts or unconsidered insights. The “mental program” is something the backmen have led at Richmond. Two years earlier, Emma Murray, a mindfulness expert, came to the club and began working with individuals. Among the first were Dylan Grimes and Steven Morris. Now Rance, Ellis and Astbury are all faithful adherents. Most take part in one-on-one sessions with Murray, but the defensive line also does regular work as a group. When playing in Victoria that means gathering them together in person, but for an away game such as this, Murray records a sound file of the session. The words aren’t pro forma, either. Murray sat in on line meetings during the week, and talked with Rutten about what key messages he wanted reinforced. All he needs to do now is push play. And so in the darkened room, Houli sits on the floor with his back against a wall, legs straight, hands in his lap. Grimes lies flat on a massage table at the back of the room. Astbury sits bolt upright in a chair, hands placed on his knees. Conca sits cross-legged, chest out, like a boy in the front row of a school photo. Rance lays on the carpet with a hat over his face—Ellis, too, with the glare of the flatscreen on his head. Short is squirreled away in a corner on his back, with his room key tucked into his sock. Now the voice of Murray enters the air. “I want you to start by closing your eyes and taking a deep breath,” she says. The players’ chests rise and fall in response. Over the next eight minutes, Murray helps them picture how each of them wants to play against the Crows, encouraging them to feel their breath and energy, and the energy between each person in the room—tuning out distractions, and tuning into this space. She asks them to engage their imagination, bringing images of one another into their minds—mental pictures of them playing, using their strengths. She wants each player to see themselves alongside a teammate now, to see themselves winning together. She gets them to zoom in on these mental pictures. To focus on how they talk to, cover for, fight with, and sacrifice for each other. She asks them to flick quickly through each individual there and what they bring to the contest. To see each face in this room, and feel trust in them. To feel excited by what they see in their minds. Now she gets them to zoom out, and see the entire backline working as a group—one big machine functioning and firing. She asks them to imagine any part of the game they want. See it unfold. Watch the ball enter their zone and then be repelled. See it coming toward them. See them beating their opponents. See them corner and control the opposition. She takes them through celebrating on the siren, in the rooms, and how great it feels within this group. They cough and sniff as they open their eyes.